Welcome to our two-part series comparing the advantages of the popular Nest Learning Thermostat over the well-designed Honeywell Wi-Fi thermostat. Both the Nest and the Honeywell Wi-Fi are similarly priced ($200-$250 depending on rebates and where you shop) and offer remote access via web and mobile apps, but the Nest has some neat advantages over its Honeywell brand competitor. Nest learns your patterns effortlessly. The Nest’s main selling point is the way it learns your routine. 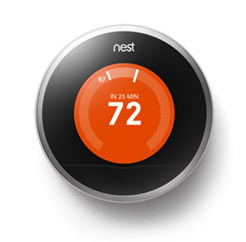 If you set it to 62 degrees at 10:00pm, Nest will begin doing that every night on its own. If you wake up every day at 7:00 and raise it to 70, it’ll learn that too. When the Nest detects you’ve left the home, it switches to away mode to save energy. Nest takes about a week to learn your routine, but it never stops learning. The Honeywell Wi-Fi learns your system, rather than your behaviors. The Honeywell does not have motion sensors and does not “learn” your preferences – you input your schedule manually. Stylish design. Some users enjoy Nest’s one-button design: turn the outer ring like an old combination safe dial, and push the whole thing in (like a giant button) to confirm selections. By comparison, Honeywell’s Wi-Fi thermostat is a (larger) touch screen that looks more like a desktop computer program. Leaf badge. 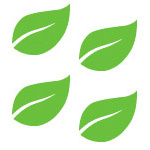 The Nest rewards energy efficiency with a green “Leaf” icon, displayed on the front of the thermostat while operating at a certain degree of energy efficiency. 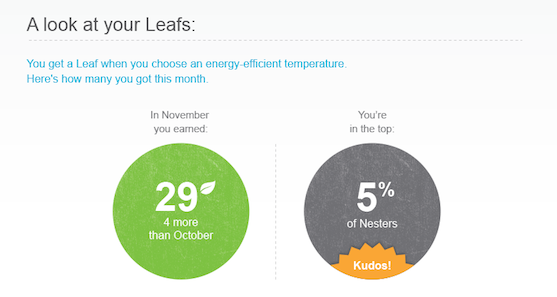 Collecting Leafs is like getting a gold star for making smart energy choices, and users like seeing their Leaf collection in the monthly report. Schedule 4+ time periods in a day. Nest allows for more than four time periods in a day; Honeywell allows four. If you come and go a lot (such as home in the middle of the day for lunch), this might make a difference to you. Energy usage reports. The Nest lets compiles your data into a pretty report each month. Here, you can see how many hours your system ran, how many Leafs you earned, and how efficient you were in comparison to other Nest owners. This cool feature is noticeably absent from the Honeywell Wi-Fi thermostat. The Nest produces a detailed and beautifully laid-out monthly energy report. Read more about the Nest’s monthly energy reports on the Nest blog. DIY Installation. Some, but not all, users are able to install Nest without a “C” wire, but the Honeywell Wi-Fi absolutely requires this wire. Adjust the 7-day schedule from the iPhone app. The ability to tweak the weekly schedule is noticeably absent from the Honeywell Wi-Fi’s companion app. Includes a built-in level and screwdriver. The Nest’s round design might make using a traditional level tricky, so it’s a nice inclusion. Google bought ’em. Anything can happen, but Google’s stated interest in strengthening the Nest brand and home connectivity in general should fuel improvements and new Nest products for years to come. REVIEW: Read our full Nest Learning Thermostat Review. Is the Nest right for you? If you love the design aesthetic, want a monthly assessment of your energy usage, and don’t want to input a schedule for the thermostat to follow, the Nest might be the thermostat for you. The only real drawbacks of the Nest are the limited on-unit controls and the occasional report from users who say the motion-sensor thinks they’re not home. Still not sure? Read about the Honeywell Wi-Fi’s advantages over the Nest! 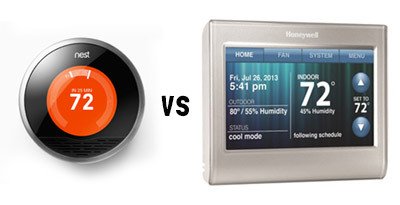 honeywell vs. nest Nest nest advantages should I get a nest?